Hitting a helpless animal like a deer, a dog, or even a squirrel with your car is probably one of the worst feelings any driver can experience. Yet, we have all probably had some sort of experience with this. Big animals, like, deer, or dogs can sometimes do really significant auto body damage to your car or truck. If you are one of those people, you probably have a few question concerning the repair, and your insurance coverage. According to the National Highway Traffic Safety Administration (NHTSA) there are 1.5 million car accidents involving deer per year. And, according to the Insurance Institute for Highway Safety, the average collision cost for this type of accident is $2,800, with the figure leaping to $10,000 if injury is involved. As far as your auto insurance company is concerned, hitting an animal is typically a covered loss under your comprehensive coverage. Comprehensive coverage protection often stipulates that “collisions with a bird or other animal” is covered. Some states may actually let you choose whether you want to have these animal collision losses paid under collision coverage or your comprehensive coverage. It depends on whether your state is an “at fault” state. Because this type of collision is a not one where you are at “fault” for the damage, your car insurance company is most likely to process this through your comprehensive insurance coverage. Remind me again of the different auto insurance coverage types? Comprehensive Coverage (property damage) helps pay for damages on covered costs that aren’t caused by a collision. These events include storm damage, a rock hitting your windshield, or animal collisions. Collision Coverage helps pay for vehicle repairs if you’re involved in a collision with another object like a car, or a tree. It’s important to note that for an animal accident to be considered a comprehensive loss there must be physical contact with the deer, otherwise it will likely be processed as a collision loss. Will My Insurance Rates Increase After An Animal Accident? Hitting a tree, a person, or another car is viewed as a different circumstance than the unpredictable act of a deer dashing across a highway or rural road. Since deer accident claims are usually filed under your comprehensive coverage where there’s no fault assigned, it’s not likely that your auto insurance rates will increase. Bear in mind that if you have other prior claims under different circumstances within the last couple of years, your rates might go up. Everything is a risk variable. So check with your local insurance agent to see if you should file a claim. Every state and every individual scenario is different so there is no one fit all answer. Some insurance companies risk formulas are different, and the animal collision could raise your rates even if only slightly. If your state allows it, and you choose to file the loss under collision coverage, your rates may be impacted. Stay attentive and drive the speed limit. You’re more likely to see deer and react more quickly when you’re alert. Use your high beam headlights at night. In areas known for their deer population—look for deer crossing signs—your high beams will better illuminate the sides of roadways. You can also see the light reflected in their eyes better with your high beams on. Remember that deer often travel together. If you see one deer, chances are there are a few more you can’t see. Slow down as a precaution. Don’t swerve! While you may be tempted to do anything to avoid hitting the deer, jerking the wheel may point you straight into oncoming traffic or cause you to lose control of the car altogether. 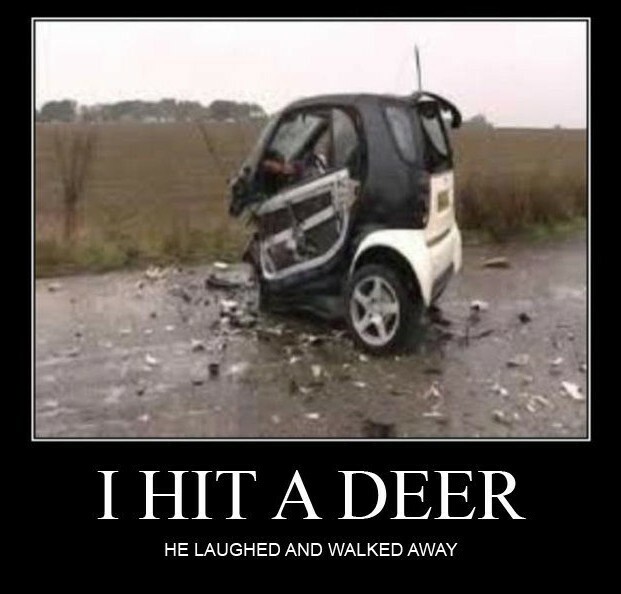 If your vehicle sustains damages after hitting a deer, you will need to decide whether or not to file a claim. Let’s say for example, that your deductible is $1,000 and the estimated damage is $465, in this case you will not be covered because the damage is less than your deductible. However, if the damage total is $1,780, After paying the $1,000 deductible, your auto insurance company would then pay the remaining $780. You should contact your insurance company and determine if it makes sense to pay the whole $1,780 out of pocket and avoid the risk of an increased insurance rate, or worse, having your insurance company drop you.